Proud Mary en Provence. Photo provided by HIDE. The seasonal elixirs use science to achieve their savory profiles. Astronomer Edwin Hubble was famously quoted in the May 1929 issue of Harper’s Magazine: “Equipped with his five senses, man explores the universe around him and calls the adventure Science.” It’s one of those phrases that’s printed on museum gift shop refrigerator magnets and inspirational science class posters. But what does it have to do with cocktails? Hubble’s quote popped into my mind a couple of weeks ago while HIDE’s beverage director Scott Jenkins described the bar’s new spring and summer menu. He tossed around words like “enzymes” and “pectin” and “acid” and “centrifuge.” I was having a cocktail that combined mezcal with celery, lavender, and Italian rosolio, known as Italicus, made from rose petals and bergamot. It was part science class, part sensory overload—explore the universe around you. I requested the “weirdest thing on the menu.” He responded by sliding a Proud Mary en Provence across the marble bar. Like many of HIDE’s drinks, a centrifuge is used in the production of the Proud Mary en Provence. The process is technical—scientific, if you stretch a bit—as the device spins ingredients, really, really fast to separate the items by their weight. Think of it as a high-powered filter. The flesh of the fruit is completely detached from the liquids. 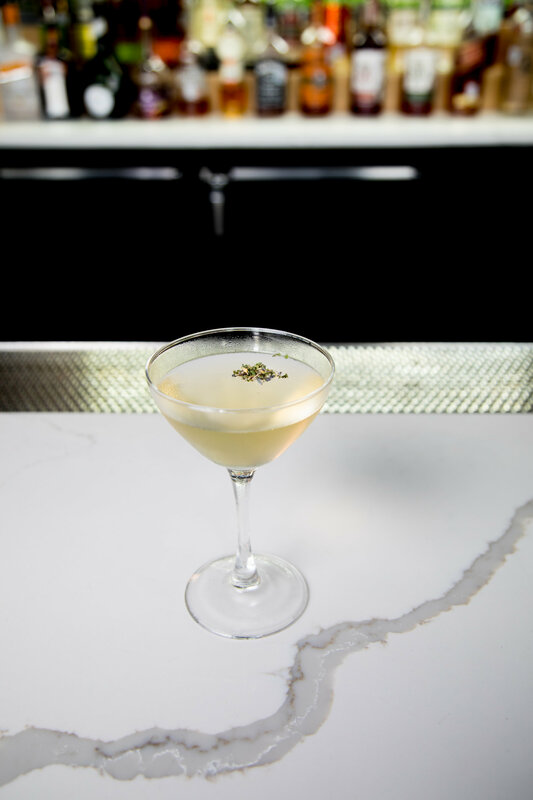 Tomatoes are clarified in the gadget and their watery remains get combined with Citadelle gin, clarified lemon, house-made herbs de Provence, and black and green cardamom. The cocktail is served up. Initially, the drink is bright and tangy, the gin gently masked by the cardamon and the acid from the tomatoes and lemon. It finishes savory because of its blend of herbs: chervil, rosemary, sage, thyme, oregano, lavender, dried garlic, and marjoram. It’s a lot to process. I liked it immediately but was unable to coil my mind around what was going on until the third, maybe fourth, sip. I left convinced that the Proud Mary en Provence is the best new veggie-based cocktail in Dallas. But there are other galaxies beyond the Milky Way; my theory was shattered days later after visiting Midnight Rambler. The cocktail den, located in the basement of the Joule Hotel downtown, has also released a new menu. Their floral-and-herb-focused seasonal selection is dedicated to the vernal equinox, which marks the beginning of spring. Mad as a March Hare was the first item on the list to catch my eye. 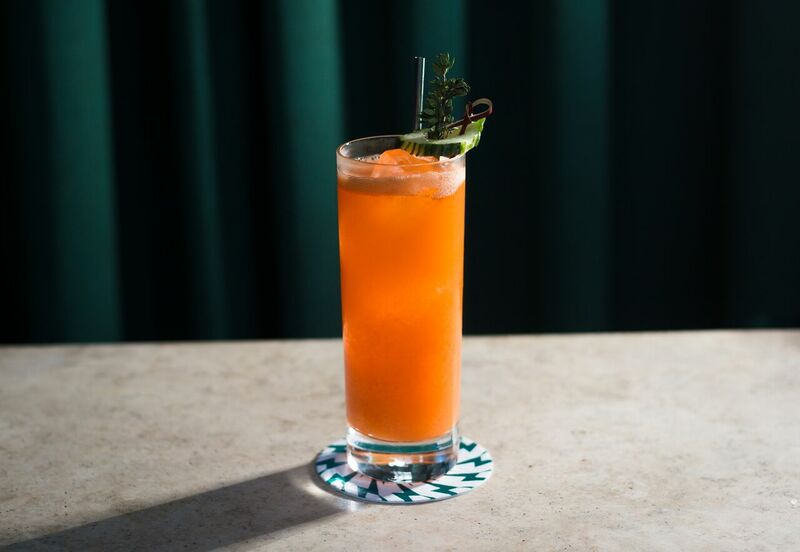 The drink is made with blanco tequila, vermouth, cucumber, dill, lemon, and house-made carrot soda. Mad as a March Hare. Photo provided by Midnight Rambler. “Mad as a March hare” is an English idiom that refers to the breeding season of the European hare. The folks at Midnight Rambler combine this with Aztec mythology. Mayahuel, the female divinity affiliated with the agave plant (tequila! ), had enough breasts to feed her 400 rabbit children, known as the Centzon Totochtin. These rabbit gods represented the many ways that people could get intoxicated. This is the inspiration behind the drink. Yeah, sure, it’s disjointed, but it’s amusing nonetheless. Blanco tequila is combined with Dill Aquavit. The house-made soda is created by juicing carrots. The liquid is clarified in a centrifuge and mixed with mineral water, malic and phosphoric acid, fructose, and is force-carbonated with CO2. The drink is semi-sweet and effervescent with herbaceous undertones. Both veggie-focused cocktails serve as refreshing spring elixirs. Go, nurse from the breasts of Mayahuel, and explore the boozy universe around you.